This is my go to recipe as soon as I feel the slightest tingle in my throat. 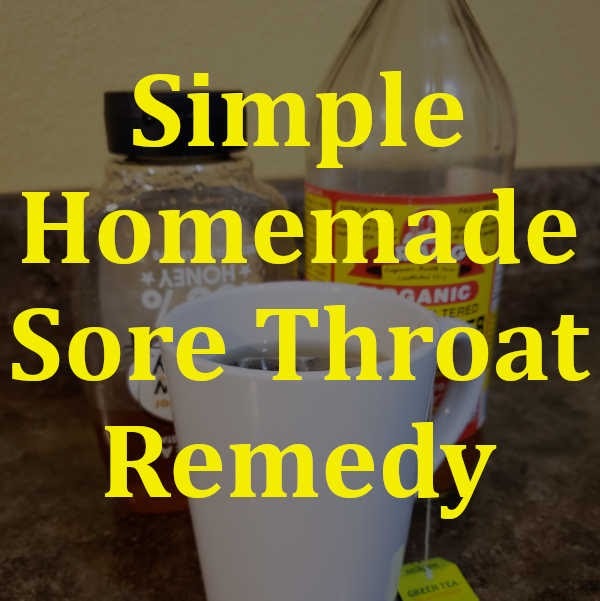 I've been using this recipe for a few years now and it never fails to get rid of my sore throat quickly. I'm excited to share it with you today. A few years back when my oldest started complaining of a sore throat I started doing some research online to find a home remedy. Although I am not against giving my children medicine or taking medicine myself, I always like to view all of my options first. If I can find a cure that is safer than over the counter drugs, you can bet I'll try it. I was able to find several recipes that claimed to work and realized that many of them included one or two of the following ingredients. I decided to make my own concoction using all of these ingredients. 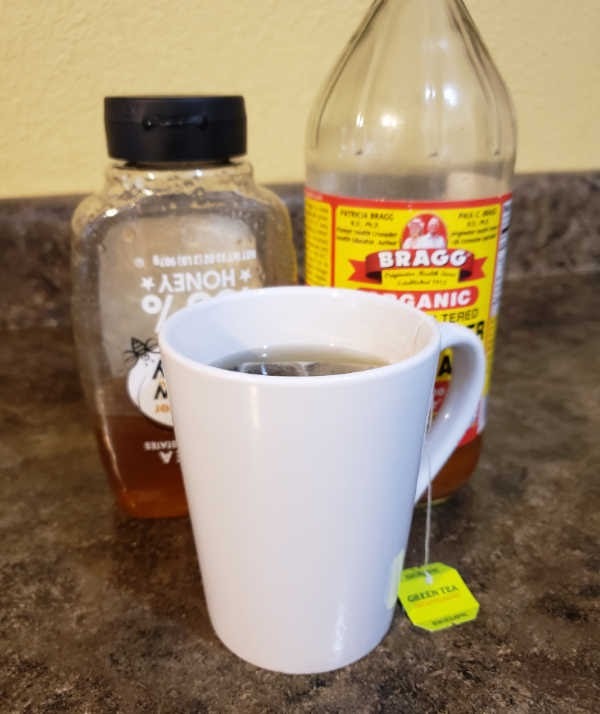 Starting with a cup of decaffeinated green tea I added a spoonful of honey, a small splash of lemon juice and a teaspoon of apple cider vinegar. My daughter loved this stuff and actually ended up drinking 3 cups of it throughout the day. The next morning she woke up and told me her throat no longer hurt. It was a couple days later that I awoke with a sore throat. I made the same drink for myself (I believe I had 2 or 3 cups that day) and the next morning I had no trace of being sick. Be sure to use decaffeinated tea for children. You could also skip the tea altogether and add the rest of the ingredients to warm water. This has a very odd taste that may not be for everyone. Although my oldest loved it, my youngest would not touch the stuff. You may want to mix the first 3 ingredients together and then slowly add the apple cider vinegar to your desired taste. Perfect timing:) I started having a sore throat yesterday. Definitely going to try this. So happy I could help. Let me know how it works for you. Thank you. It's a wonder I ever made it through English class. I am horrible with grammar. I'm pretty sure soar is in reference to soaring through the sky, so i believe you had it correct in the first place, your grammar is just fine don't doubt yourself too much hun. Agreed. Soar is to fly or float aloft. Sore is pain to distress. Please verify before correcting someone. You blog is nice by having the simple remedies for the treatment of sore throat in a natural way, It's nice.. Thanks a lot for giving out. Do you think eliminating the honey will make a big difference? I'm on a very strict diet and supposed to stay away from honey in addition to all sweetners. (Natural sweetners like Stevia or Xylitol are ok).